This week we are featuring the work of Rachel Snack, an artist, textile conservator and the founder of the textile studio Weaver House. You might remember Rachel from Episode 5 of the Weave Podcast last year. 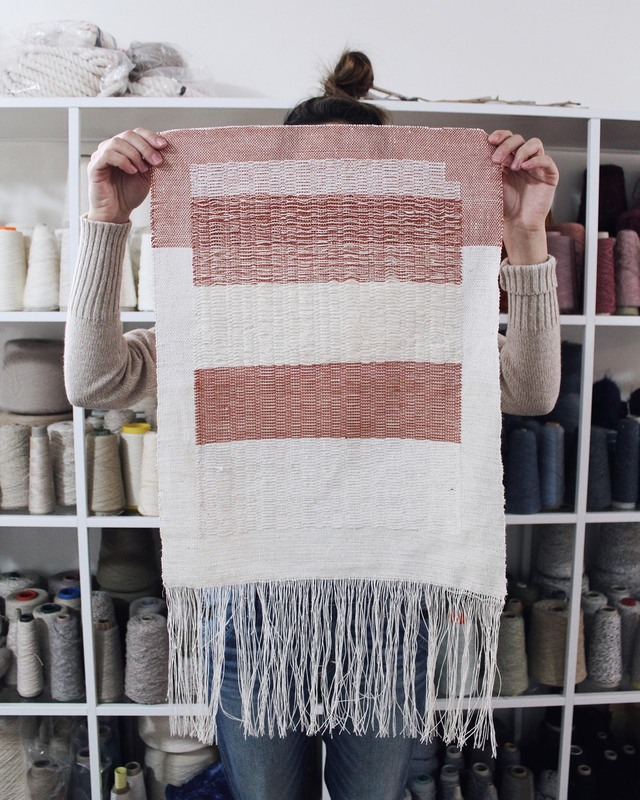 Using yarn from our shop, Rachel designed a small collection of wall hangings and shared her process with us. "Logically speaking, the grid extends, in all directions, to infinity. Any boundaries imposed upon it by a given painting or sculpture can only be seen – according to this logic – as arbitrary. By virtue of the grid, the given work of art is presented as a mere fragment, a tiny piece arbitrarily cropped from an infinitely larger fabric. Thus, the grid operates from the work of art outward, compelling our acknowledgement of a world beyond the frame." The grid is everywhere, an abstracted concept that can be applied simply to lines created by man through structure and material, and figuratively to the matrix of 1’s and 0’s that compute space. The matrix, as expressed to be all that is around us, governing us and guiding us. The theory of the grid extending beyond: beyond painting, being, structure, creation, art, spatial language and form, liberates the left and right angles of woven cloth. It opens the door for experimental structure and abstract shape. It is here that the grid of weaving is challenged, creating a chasm of undefined and liberated instinctual design. Structure delineates the composition of the grid on the loom, inventing order, dimension, stability, method of space, and aesthetic qualities. In my work I challenge the boundaries of the woven grid by manipulating structure, and developing spacial forms a-typical to traditional cloth. I weave in collections, utilizing the same warp for multiple pieces. These weavings share a similar language because they use variations of the same weave structure, however maintaining a complete uniqueness. The broad range of shape achieved from the same warp relies on a weave structure that supports tabby, allowing me to use two shuttles and draw with a ‘supplemental’ weft on the loom. This concept originated after studying overshot structures, which rely on a tabby pick in-between picks of the overshot design. 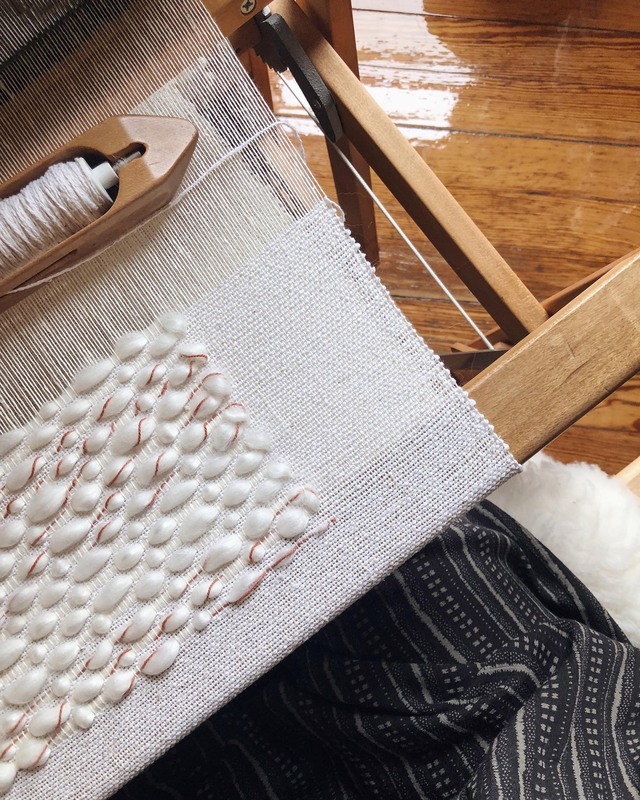 Creating structures that allow for a pick of tabby without compromising the original design means that abstract shapes can be ‘drawn’ with an supplemental weft. 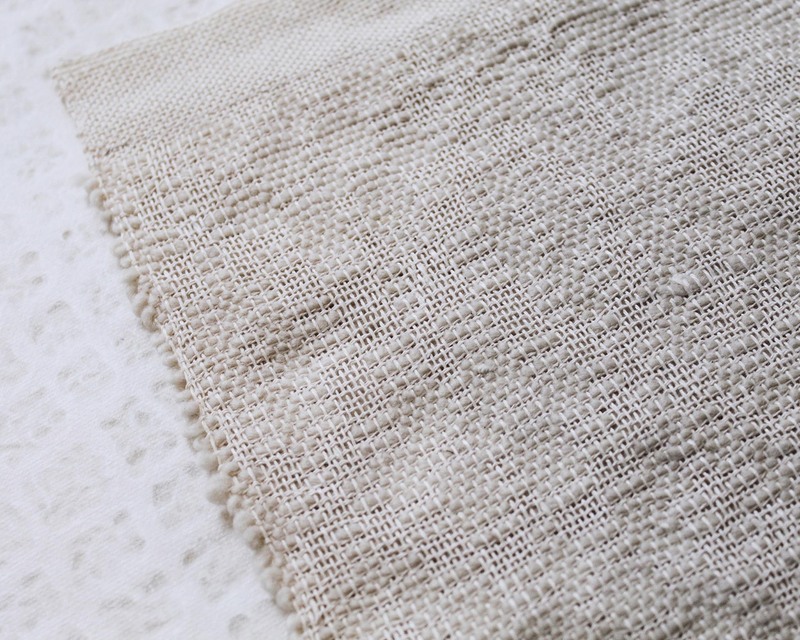 Essentially, these weavings are created by a pick-and-pick method, first throwing a pick of tabby that travels the entire length of the cloth and acts as a ground. A second shuttle is then used to throw a pick of the weave structure, however acting like a tapestry technique. Additional experimentation occurs when I change my treadling sequence or tie-up completely (this is easiest with a straight-draw). As an example, if my treadling sequence was 1-8 repeated, I might treadle 1,3,5,7 instead, abstracting the design further. I use this technique to capture and memorialize space and scape – a documentation of time throughout landscape and material evidence of the human hand. These pieces celebrate the quiet and often missed moments in life, create a visual of my sacred space, and the fragmented memories of my relationship to place. They are imperfect, subtle and ephemeral. 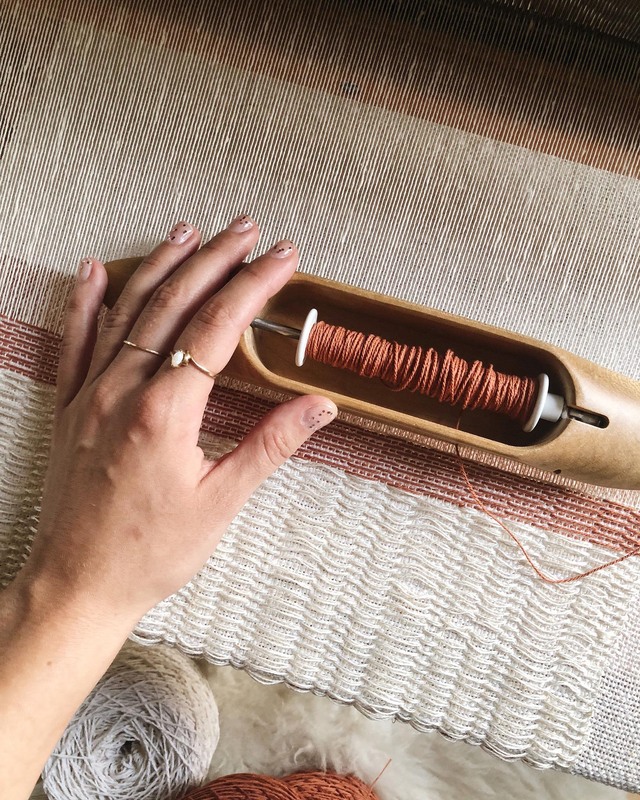 Although I use this technique to create a tactile language for contemporary weaving, I believe it can be also implemented in functional and wearable textiles. Happy weaving! A few of Rachel's picks from our shop include 3/8 Italian Cotton, Italian Silk Noil, Fine Paper Yarn, Linen Weaving Yarn and Wool/Tencel Top. 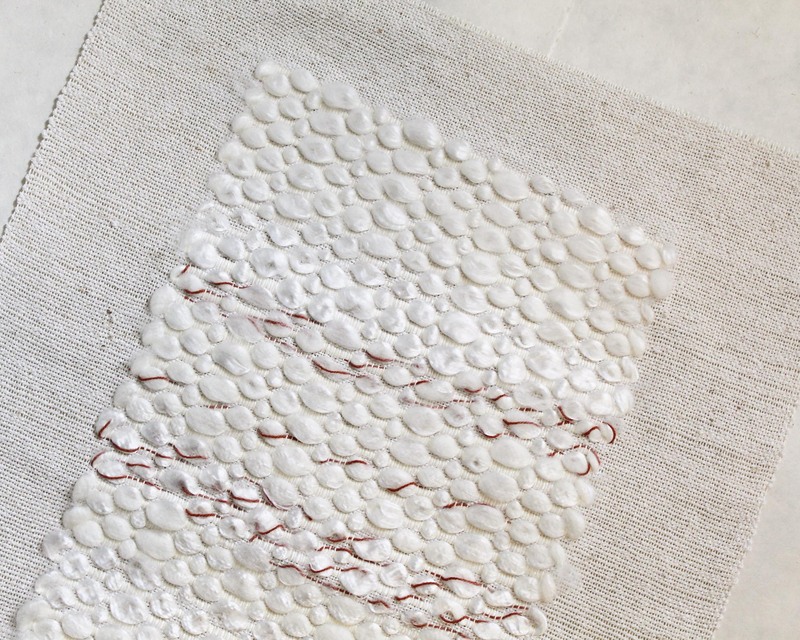 Rachel Snack is an artist and textile conservator. She received her Bachelor of Fine Art in Fiber & Material Studies from The School of the Art Institute of Chicago, and her Master of Science in Textile Design from Philadelphia University. Rachel has conserved objects for exhibitions at The National Constitution Center, The Philadelphia Museum of Art, The Fabric Workshop & Museum, The NY Public Library and The Museum of Arts and Design. 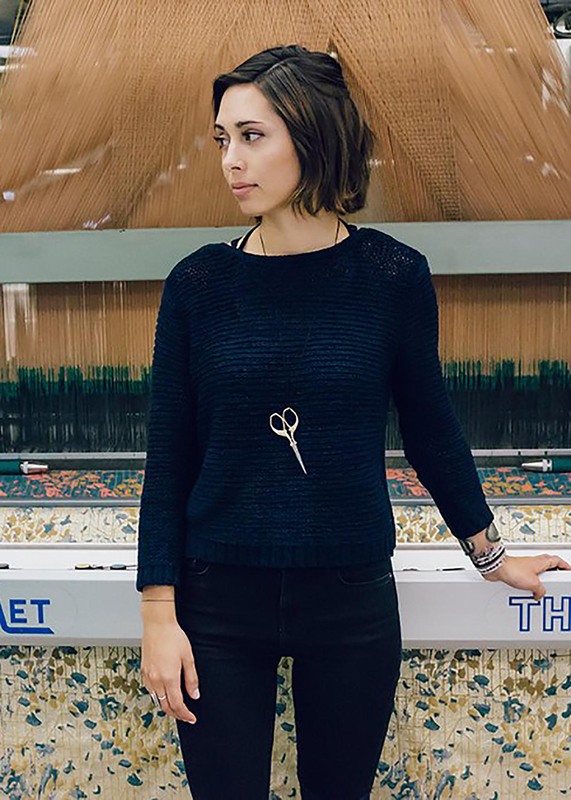 In 2014 Rachel founded Weaver House, a textile studio, workshop and online store. 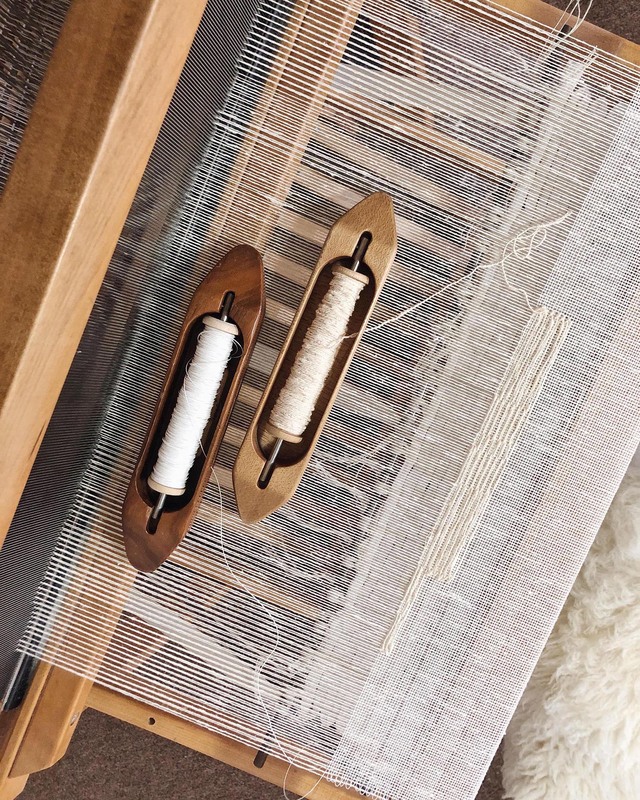 Weaver House creates heirloom textiles in homage to craft tradition, and the dialect between maker and loom.